My sister unpackaged the two trees for my parents in NY and says they were great quality - very healthy, green, full with a strong pine smell. Sha also said the trunks were properly cut to ensure easy setup which she appreciated. Thanks again and happy holidays! Just wanted to thank you as the tree turned out perfect! Just wanted to message that we love our tree!!! Thank you so much for offering an awesome "chemical-free" tree that I don't get stressed out about my little ones decorating. Thank you a million times over for making my Christmas stress-free! We received our Christmas Tree and it is beautiful! Thank you so much for your kind attention. Wishing you health, peace and love during the holidays, and always. Just wanted to say Thank You for the wonderful tree. The extra branches became our Christmas center piece. When you're really excited about winning a tree from Honey Creek, WI !! Thank you Windblown Tree Plantation !! Thank you so much. Merry Christmas to you and yours and may the Lord bless you and yours today and always. The Christmas tree was absolutely lovely. The tree you sent me is so very pretty! I was able to set it up and feed it yesterday afternoon and will decorate it later today. The shape is gorgeous and it is very fresh - thanks so much - love it! Hope you had a wonderful Christmas and all the best in the new year too ! I just wanted to say thank you again for another beautiful Christmas tree! It was perfect. Just fyi I heard about you in Martha Stewart's Living December 2011 Magazine. We ordered our tree for delivery to southern California. We were ecstatic when we saw it. 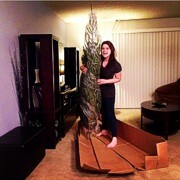 The tree arrived in perfect shape, was the perfect size and was delivered on the perfect schedule. It all added up to a perfect Christmas! We look forward to many more Christmas trees from Wayne's farm. Hi, The tree arrived safe and sound, so well packed! It is up and decorated and so pretty! We are very happy with it. We have never had a tree before, that was so fresh, it was bouncy! Thank you! Our son, Marine Cpl. Mathew... returned from Afghanistan in late February 2010. We delayed celebrating Christmas until his return. The fresh cut Christmas tree you sent us made this a very special Christmas, one we will remember for years to come. Want to say thank you for sending such a lovely tree. It is the first live Christmas tree that we had since moving to Florida over 30 years ago. It was perfect in shape... I wanted you to know how much I enjoyed the tree. Just wanted to let your know we received our tree and it is absolutely perfect. We have it up and decorated and couldn't have asked for anything better. In fact, and I'm really not joking, please consider us your first order for next year. We'd like the same size and width. It really is gorgeous. We had people see it as we took it out of the box and left it out to drop for a bit, and they were all amazed by what a REAL Christmas tree looked like. Thank you so much. The tree arrived and is beautiful. I can't believe I have a tree from Wisconsin. It feels like part of my old home has arrived. From now on I will order our tree from you and your family. We are very pleased. I got the tree just as promised. It smells so good and has a wonderful shape. Thanks so much for spreading this Christmas cheer with Southern California. We can't get trees like this here!!!! The tree was everything you said it would be. Nicely packaged, delivered when requested, very fresh. My tree arrive yesterday in perfect condition. I put it up tonight and it's a great shape and fullness. I can't wait to decorate this weekend. 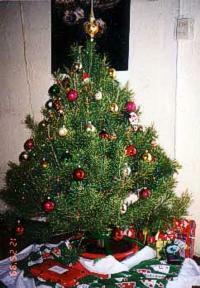 The tree was great, and stayed fresh for weeks!!! Fedex just delivered... It is beautiful! My tree arrived Tuesday safe and sound. It is really cute and smells wonderful! It was fun tracking it across the country. I love my tree! Thanks so much. We were very pleased with our Christmas tree and the prompt delivery. Thank you very much for your help. We hope you had a Merry Christmas and a Happy New Year. We will be ordering another tree from you guys next year! I wanted to tell you that we loved the tree and the two wreaths. Thank you for your part in making Christmas special. We received the tree and it is in wonderful shape. Thank you and happy holidays! The tree and service were excellent, thank you. I would order again and recommend your web site without hesitation, based on our experience. Happy Holidays and a prosperous new year to you and your family. I have been a customer of Windblown Tree Plantation for the past two Christmas seasons. My satisfaction level is very high and I have nothing but praise. Their web site is informative and easy to use, the people that you reach by telephone with questions about the trees are very nice. Wayne/Ericka Raisleger are easy to reach by e-mail and couldn't be more helpful. The trees have arrived on time and very healthy, and the trees themselves are beautiful. I plan to use Windblown next Christmas and I gladly recommend them to everyone. The tree I bought from you was wonderful! Fresh, of course, and great scent, but also beautiful shape. Clean too! This is the third year I have ordered a tree, and this one is the best yet. Interestingly , the Wall Street Journal called and interviewed me about my experience buying trees through the mail. The article ran in the weekend edition the Friday after Thanksgiving. The writer expressed her pleasure with the friendliness you exhibited, and I felt some regret at not visiting with you over the phone about the tree. We got the tree today, and already it smells so much better than the other smaller tree we had ordered from a different farm. Thank you so much!!!! There is no other Christmas tree than a balsam for me. We do so appreciate your service and speed. It smells wonderful!!! and we plan to do business with you in the future. Thanks again, and Merry Christmas. Thanks for a great buying experience!! You touched all bases with your home run; 1st - good selection/easy ordering, 2nd - reasonable prices/courteous service, 3rd - good packaging/fast shipping, Home Plate - Best Christmas tree I've ever seen! The tree delivered to Club Monaco, Miami Beach, Florida, arrived very fresh looking! Great Job! All trees arrived Fresh. Club Monaco will order more trees from you. Enclosed is a picture of the lovely wreath we received from you. 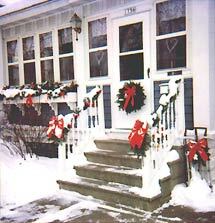 It has enhanced our outdoor Christmas motif immensely and made our Christmas so very, very special. We have been more than pleased with the shape and form and the excellent quality. Continued luck to you in your tree business. The Christmas wreath was beautiful! So fresh and natural. Best we ever purchased. We are very pleased with the tree and wreath you shipped us and will be back again next year. Have a Merry Christmas, and a good rest. We're certain you deserve it during the rest of your holiday season. Thanks for the WONDERFUL tree. It was so fresh!! It was the best tree I have ever bought. And it arrived as agreed. I told all my friends about it. Next year I want a much bigger tree - maybe 7 or even 8 feet. Thank you for our fine tree - we're even sending you a picture! Thank you for doing such a great job. My grandparents are very happy! Thank you again. Merry Christmas and a Happy New Year. Your Christmas tree arrived yesterday and I am very happy with its freshness. It is a wonderful tree and has the fresh, natural odor one would expect from a fresh cut tree. I thought you would like to know how pleased I am. Trees are beautiful and service great; will be coming back next year again. Wow, I just wanted to say Thank You for the tree. At first I thought you guys were pulling my leg and it was a joke, until my kids and I saw the Fed Ex guy pull up with a big box that said WI Tree Farm. Our mouths dropped to the floor and we started jumping up and down. Thanks for making our Christmas special!